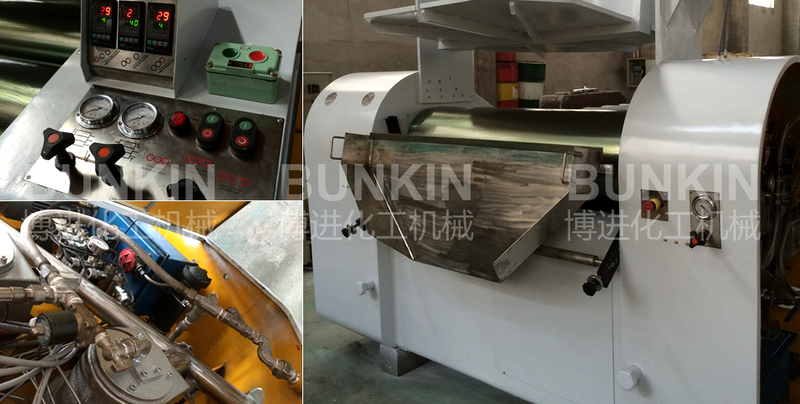 Hydraulic Control Three Roll Mill_Anhui Bunkin Chemical Machinery Co.,LTD. Applied materials: Suitable for dispersing and grinding materials in industries such as ink, color paste, adhesive, biological, pharmacy, foodstuff, cosmetic, paint, photovoltaic material etc. 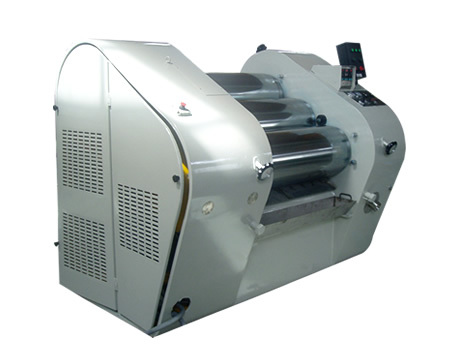 A three roll mill is a machine tool that uses the shear force created by three horizontally positioned rolls rotating at opposite directions and different speeds relative to each other to mix, refine, disperse, or homogenize viscous materials fed into it. They are widely used to mix electronic thick film inks, high performance ceramics, cosmetics, plastisols, carbon/graphite, paints, printing inks, pharmaceuticals, chemicals, glass coatings, dental composites, pigment, coatings, adhesives, sealants, and foods. It is very suitable for high vicious particle size reduction. Application Fields: Suitable for industrial coatings, general printing inks, and general pigment dispersions, calcium carbonate powder, liquids agrochemicals etc. The cylinders, gearing wheel and belt pulley are dynamic balance designed, so ithe machine operates with the lowest noise and safety. The highly sensitive super-sonic sensor traces the material surface and the system will stop working when the quantity of the material is below the level of material surface designed.